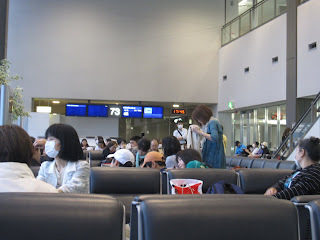 Last Thursday (May 28), I was lucky enough to be in Taiwan during one of their major holidays. 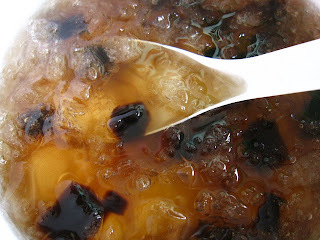 The Dragon Boat Festival, better known in these parts as Duanwu Jie, incorporates three main activities: eating zong zi, drinking rice wine, and racing dragon boats. As far as the history, I'm not entirely sure. I asked a few people about the festival, and everyone's response was the same: you have to eat zong zi and watch dragon boat races. Where is the history? I'm inclined to believe that the holiday has probably become more of our Easter/Thanksgiving holidays in the United States. Some people do not even think of the significance of the holidays, other than dying Easter eggs and eating Turkey. 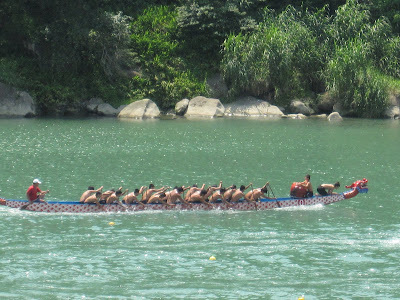 Dragon boat racing is a popular event, and requires training far in advance. 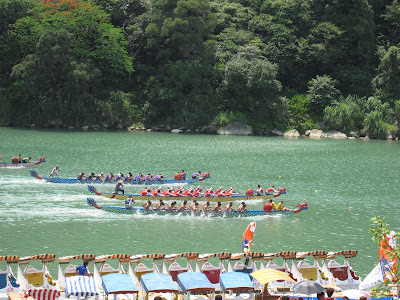 Here are a few snap shots of dragon boat racing! The race has begin, and Boat 1 seems to be ahead. Notice the flag-grabbers at the front of the boat, and the awesome drum that keeps the rowers together. Close-up of one of the stragglers. 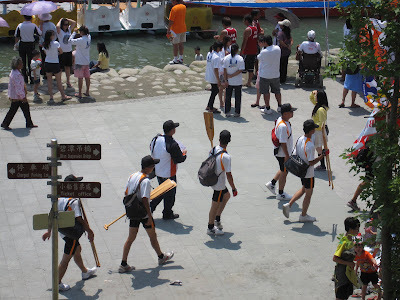 The rowers and their equipment. 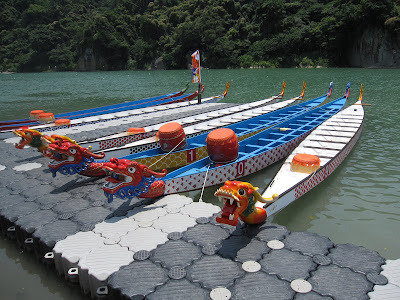 The terrifying, dangerous dragon boats! 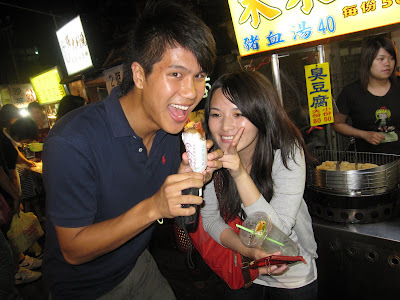 Nightlife in Taiwan has it's similarities and differences when compared to the States. 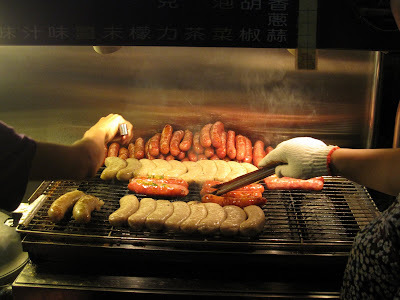 While there are 'pubs' and clubs, nightlife truly exists in their night markets. What are they? you ask. Essentially, they are streets packed full of people, food carts, and clothes. Night markets spring to life around 5 P.M. and do not shut down until 2 A.M. With this sort of eating habit, how is everyone SO skinny? It's something that has been boggling my mind ever since the first night I saw my roommates go out and buy fried chicken at 10P.M. 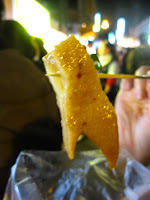 Here are only a few of the things I ate at one of my night market outings. Coffin sandwich with beef and pork. Named after it's coffin-like purpose: container of the deceased. 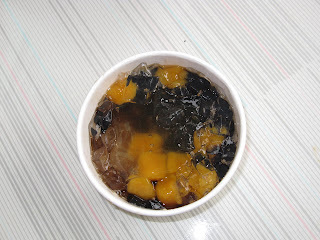 I never knew that fish eggs could become ONE. These fish eggs have been smashed into a thick, salty substance. Quite expensive! 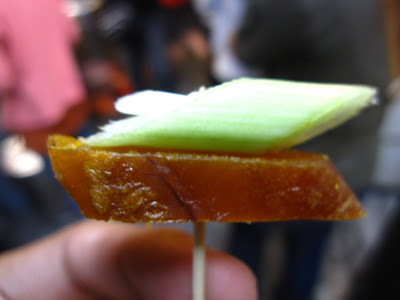 Served on a toothpick with a piece of green onion. Large intestine wrapping a small intestine. It sounds gross, but it's actually delicious. The large intestine is actually filled with rice, so similar to the skin of a hot dog. The small intestine is actually sausage. Not too disgusting, eh? Now, this probably takes the cake! 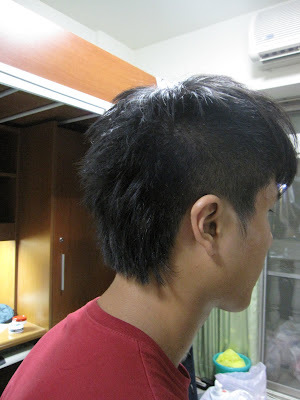 Similar to my adventures in Turkey resulting in a haircut, I have also decided to be trendy in Taiwan. Every one kept telling me that my hair was long, and had no style. Taipei is a city of fashion, mainly taking after the Japanese. There are also influences from America and Korea, but I keep seeing and hearing from others the strong Japanese influence. Here are some random photos of my new haircut. 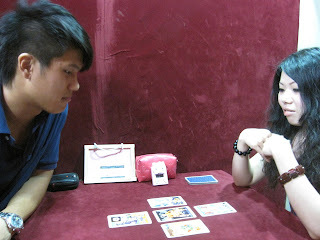 Tarot Cards... Nearly everyone I meet here asks me what zodiac sign I am. When I was first asked this question, I thought they meant the Asian zodiac sign. Well, to my surprise, they actually meant my celestial sign (Virgo). I would have never guessed that this would be important. They actually read into the signs and tell me my sign's characteristics and who I should be with. My desk. Notice the hair along the neck...yes, it is slanted. One side is shorter than the other. Well, my hair in Taiwan has taken a turn...for better or worse, I have yet to decide. At least, I don't stick out anymore. Not entirely true, since I still am a GIANT. But one of the cultural differences here in regards to hair is the amount of time men spend on their hair. Nearly every guy will blow dry his hair (for fear of catching colds--EVEN in the dead heat of summer). Many also 'pull' their hair. It's similar to picking, except with your fingers. I'll have to show some of you sometime. Enough about the hair. 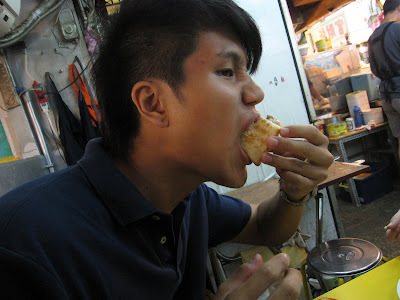 The eating NEVER stops in Taiwan! Immediately following lunch, after a few steps the most important issue at hand is the location for dinner. 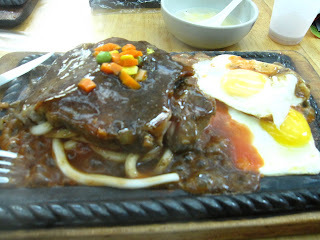 Now, I've always been one who savors the last meal, unable to even think of what I want for dinner. 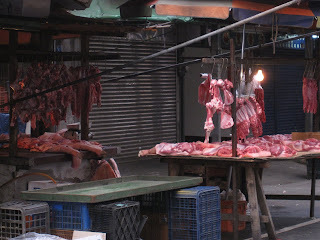 Yet, the TINY Taiwanese males and females are able to eat an abnormally large meal and ask, "What's for dinner?" within SECONDS of paying the cashier. How do they remain so skinny? I've yet to get to the root of this mystery. 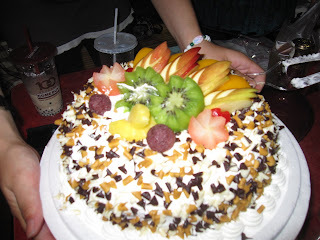 For now, let's just investigate some of the more bizarre dishes I've come across.Let's just start simple: cake. Cake here is DELICIOUS. Not only is it colorful, it is actually semi-healthy. The icing has a hint of sweetness, unlike the pounds of sugar shoved into American cakes. The cakes also have pudding in between the layers, in lieu of icing--mmm, quite tasty. If you know me, you know that I don't like icing (really sweet things), so this definitely made a 10 on my scale! Next, we have raw oysters. These have their occasional appearances in the States, but this was the first time I actually ate one. 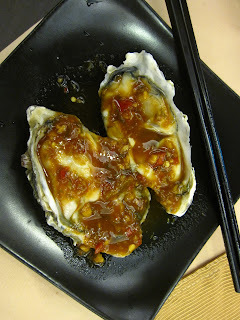 The mushy, cold meat was paired with a semi-sweet and spicy sauce. I could only eat one. 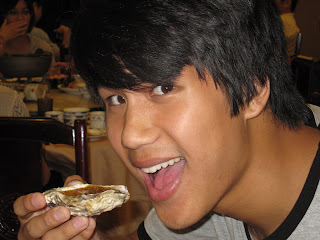 If the oyster's meat had been smaller, I might have been able to eat a few more, but one of this size was enough! Below is the testicle I consumed (I spared you the grotesque picture of my actual consumption). 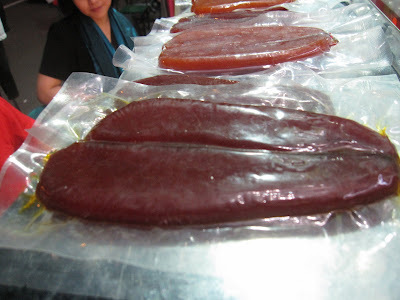 Imagine tofu and you pretty much understand the texture and taste. 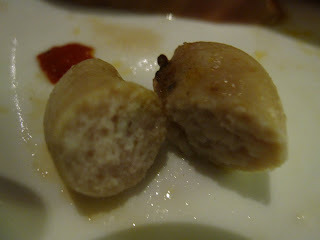 Chicken testicles are extremely expensive in Taiwan, and are considered to have healing powers--they contain a lot of hormones so they can also influence/balance the consumer's hormones. As they say in Taiwan, "Women must eat more, it's good for the skin." Below is an image of several things. Let us start with escargo (upper left). Moving counter-clockwise we have eel. Finally, we have the king of all things: fish chin! 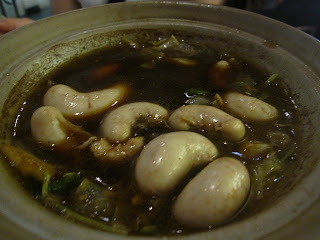 Yes, that's right, fish chin is considered to be the most delectable part of the fish. 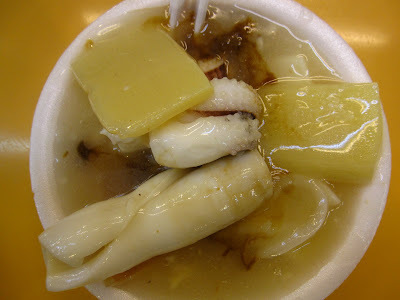 When I sat down, my host told me that I was going to be captured for eating fish chin. Everyone laughed at the table--except me. 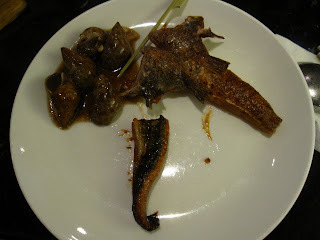 I came to find out that back in the day, the fish was divided into parts and served based on each part's tastiness. Apparently, fish chin is the most delicious part of the fish! Thus, when people came to a household to ask for money (debts/ransom) they usually went directly to the consumer of the fish chin. I won't be taken--not by the hair of my chinny chin chin! Aside from food, I've learned a lot of other things. The difficulty of their education is completely reversed compared to the United States. 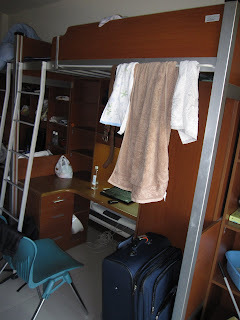 Whereas, our elementary, middle, and highschool education can be fairly easy compared to college, Taiwan's education starts rough and ends with ease. Starting when they enter elementary school, students are disciplined by teachers to learn and memorize. In middle school they are given an exam that determines their placement into a high school, and from high school they remain in school from 8-5 (public) 8-10 (private)!!! For college, high school students take a year to prepare for the entrance exam--the SOLE, DETERMINING factor in selecting their college. However, once they enter college, without the constant surveillance and pressure from parents and teachers, students slack off. Instead of exams and essays, many of the times they give presentations. Classes are a joke! They text, chat, and completely ignore the professors. (This may just pertain to the college I attend, as it is an O.K. college--according to everyone I've heard from). The most difficult part has been adjusting to the CURFEW at 11PM! At 11PM we are expected to be in our rooms waiting for our R.A. to come by and take attendance. This has taken some getting used to, as this has made many of the students into gamers... Warcraft, World of Warcraft, Diablo, etc. Here are a couple of pictures of my room and balcony's view. In Taiwan, Karaoke is one of the most popular activities for all ages. They have as many karaoke places as they have bars. I arrived just in time for Aletheia University's karaoke/singing competition. Today was the last day of three days. Each day featured around 50 singers! Their school is fairly small, probably a few thousand students but SO many showed up for this competition. Well, it was a great time, even though each night was about 4-5 hours long! After a while I got fairly bored. I've included some videos and pictures for your viewing pleasure. This is a picture of the NUMEROUS face masks that everyone likes to wear to avoid swine flu from people like me. Finally, internet! I'm sitting in my new dorm room with my 3 roommates, and finally have internet after 3 days without. I have to catch everyone up! One of the first things we did was celebrate Mother's Day. 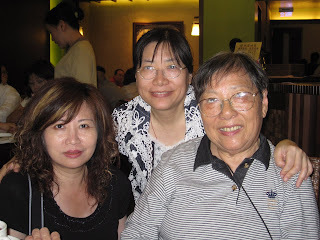 Here's a picture of my host mom (left with highlighted hair), her sister-in-law, and her mother-in-law. 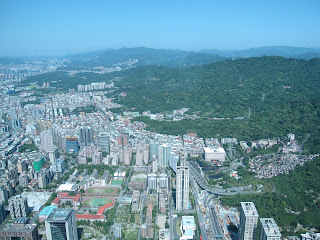 After the vegetarian lunch (mother-in-law is vegetarian because of her Buddhist beliefs), we went to Taipei 101. 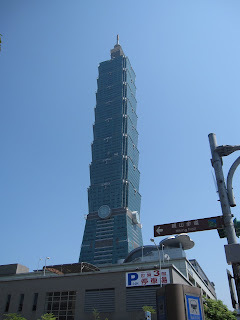 For those of you who don't know, Taipei 101 is the world's tallest or 2nd tallest building in the world. There are 101 floors! Here's a picture from up top, on the 89th floor. 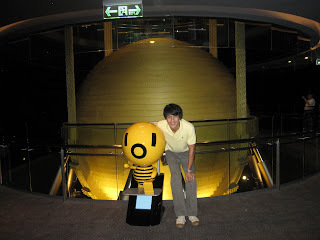 Here's a picture with one of Taipei 101's mascots...I didn't understand it either. The next day we did more tourist things. 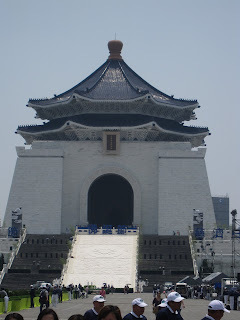 First, we went to Chang Kai Shek's memorial hall. In 1949, Chang Kai Shek came to Taiwan and started Taiwan as we know it. On mainland China, this begins Mao Zhedong's reign. 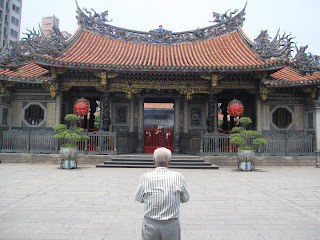 Next, we went to one of Taiwan's most famous Buddhist temples. People would light 5-6 incense sticks and carry them around praying to various gods and goddesses. Each one represented something different. One goddess helped you bear children and look after them. Another one helped you during exams, so on and so forth. You would also toss your incense into certain 'cauldrons' in some kind of order that I didn't understand. There was a path that you followed in the temple, something else that I couldn't quite grasp. My impression of Taiwan has been really positive. My Chinese has improved a lot, at least the speech has--not so much the reading or writing. 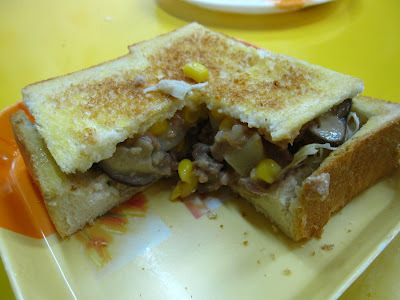 I've eaten all sorts of cheap and delicious foods (even an attempt at an American hamburger). I've been told that I'm unusually tall, dark and handsome--I've been compared to their most famous singer. Apparently, Wang Li Hong is an artist that is also an ABC (American Born Chinese) that went to Taiwan and started a singing career. 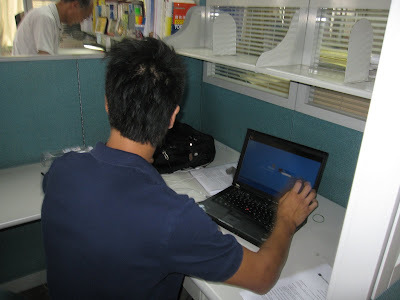 It's weird to think of tan as a negative, but in Taiwan and most of Asia the darker the skin the uglier! As for me, I'm definitely tan. We'll see how that plays out. 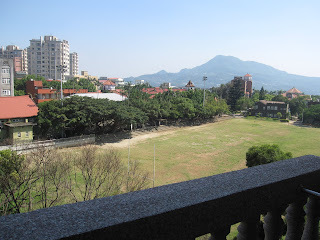 I look forward to meeting with the Dean tomorrow to discuss the rest of my stay in Taiwan!